Usually in dry ± open sandy or rocky ground, in savanna of oak, aspen, and pine, as on old dunes, jack pine plains, and rock outcrops; river bluffs and shores (occasionally even in moist forests); often at borders of conifer thickets along shores. The introduced variety is found along roadsides and disturbed places, even spreading into forests. Our widespread native shrub is var. albus, with young twigs puberulent, leaves pubescent, fruit ca. 5–10 (–12) mm in diameter and mostly solitary in leaf axils. Common in cultivation and occasionally escaped is the larger-leaved var. laevigatus (Fernald) S. F. Blake [sometimes recognized as a distinct species, S. rivularis Suksd. ], native to the Pacific Northwest. It has young twigs and often the leaves glabrous (unlike S. occidentalis), with fruit at least 1 cm in diameter and mostly in clusters at the ends of branchlets. Intermediates do occur. The records mapped for Berrien, Cass, Gratiot, Kent, Oakland, and Washtenaw Cos. are solely var. laevigatus; both varieties are known from at least eight of the other counties. MICHIGAN FLORA ONLINE. A. A. Reznicek, E. G. Voss, & B. S. Walters. February 2011. University of Michigan. Web. 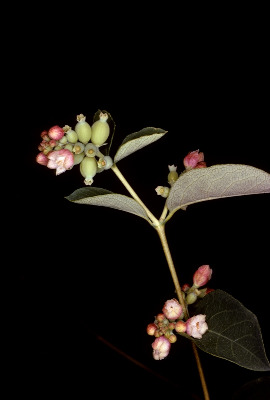 April 20, 2019. https://michiganflora.net/species.aspx?id=731.